After spending time with family over the holidays, I got a request from a few family members for some cozy accessories. Since I’m now home, and several states away, I decided to send all of these cozy creations back as a bit of a late Christmas/birthday/winter care package. I’d been looking at boot cuff patterns for a while, and there are quite a lot out there. After scrolling through Pinterest for hours upon hours, I settled on these two. I loved how cute and easy these cuffs were. The pattern suggested using Vanna’s Choice from Lion Brand, but I decided to use Lion Brand’s Heartland yarn in Acadia…I love the colors in Heartland and I think it’s just a bit softer. These will be adorable peaking out of a pair of tall boots (though I’m probably going to make myself a pair to wear with my Doc’s). So this pair took me a bit because in the middle of navigating the pattern (it was the first pair of boot cuffs I made), I was experimenting with tension. After I finished the first cuff, I struggled getting the second cuff to match in size, and ended up remaking the cuff part several times before I got the hang of it. 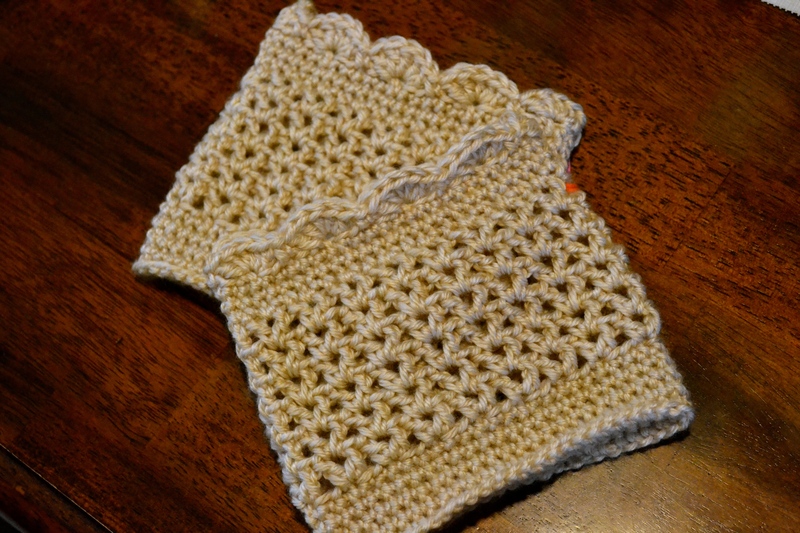 I used Lion Brand Wool-Ease in White Frost, and I loved the bits of sparkle intertwined in the yarn. It’s just the right amount of pizazz to spice up this chilly winter. I made this scarf previously for my mom and she wears it ALL the time. We both thought it would be perfect for my aunt. Even though this project comes from Lion Brand, my aunt really loved the bright colors in this yarn (Deborah Norville Everyday Soft Worsted in Cold Mountain). I really do love this pattern, but I find the length to be much shorter than desired. 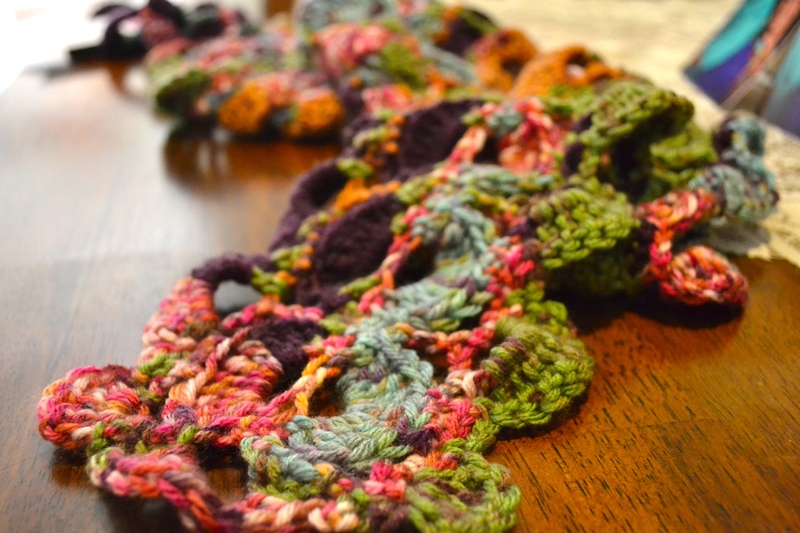 To make it longer, I added more chains to the beginning chain to make a total of 26 scallops in the first row. I’ve also made this hat before, just last month. I wanted a new slouchy cap and I really wanted to try out the puff stitch. Though my first hat ended up being a bit too big and slouchy, I think I found the right balance this time around. 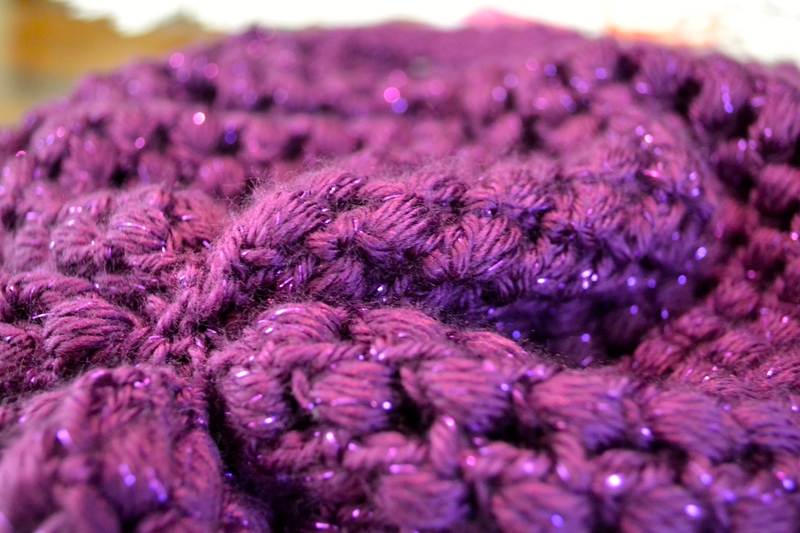 I used Bernat Satin Sparkle yarn in Amethyst, but in my first attempt I used Lion Brand Pound of Love in Soft Cream. The sparkles in the Bernat yarn were a bit difficult to manage with the puff stitch, but the end result is really pretty. All of those patterns are free (except you’ll probably need to create a free account for the Lion Brand pattern). What are some of your favorite cozy winter accessories? Let me know in the comments! Lovely pressies, I love the colourful scarf.